Ok, so maybe Michel Telò isn’t your favorite artist, but the point I’m making is that when used in the right way, music can be one of the most effective ways to really learn a language. Through music we can learn, not only vocabulary, but it also exposes us to cultural aspects of that country. Whether you’re listening to Samba, Hip Hop, Baile Funk, you’re going to pick up a lot of colloquial sayings and get a broader cultural understanding through that particular style of music and rythym. I really feel connected to this method of learning as I have experienced it first-hand. Before coming to Brazil, I had been practicing Capoeira for some time. During every lesson I was exposed to several capoeira songs, from “Zum Zum Capoeira Mata Um”, “Leva Morena Me Levar,”to Paranà ê Paranà etc. Although, at the time I didn’t really know what the hell I was singing about, I was subconsciously familiarizing myself with all the phonetics of the language. When it came to learning how to pronounce words with the “lhe/a” sound (orelhao), or the nasal sound in words like “mamao”, or “pao,” I was already ahead of the game. When I eventually came to Brazil it was like putting a puzzle together, I started to understand more and more of the language and the songs started to become more clear. The beauty of learning through Capoeira music was that I also learnt a lot about the history of Brazil as a lot of the songs tell stories of the African slave trade and its abolition. What I didn’t realize, until I started learning the language, was that the whole time I was singing in Portuguese, I was also learning the Phonetic infrastructure of the language. So, learning the language is not as easy as just listening to your favorite tracks and relaxing, but we have to invest ourselves into this process. Today we’re going to have a look at a different method of learning English, or any other language through music. Let’s look at what’s known as the Mimic Method. This method of learning was developed by Idahosa Ness, who came up with this idea whilst learning Brazilian percussion in Rio de Janeiro. Idahosa is a musician/linguist who speaks 4 languages fluently, and with his mimic method, he can fluently imitate many more. Idahosa is a talented musician who teaches languages through what he calls Rhythmic Phonetic training. His teachings are based on learning the phonetic infrastructure of the language first. This is done by going through all the different phonetic sounds before actually learning any words or the grammatical structure of the language. Idahosa encourages students to learn these sounds through music (especially rap, as it’s similar to spoken English), “we must learn THE FLOW of the language” Idahosa says. Similar to my approach to learning Portuguese with Capoeira music, Idahosa gets his students to rap in the language first, which is a way to train their auditory perception. Listen and repeat, listen and repeat, like learning a musical instrument. This method is excellent for accent reduction. Think about listening to someone playing an un-tuned guitar. Sure you can understand the song, but it doesn’t sound as good as when the instrument is fine-tuned. 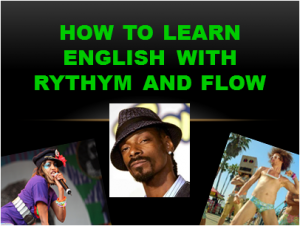 This is when repetitive training can really help your language learning experience, which is what Idahosa calls the “Mimic Method.” Instead of just relaxing and listening to your favorite songs, slow it down and mimic the singer, pretend you’re Snoop Dogg, print out the lyrics and get “gangster.” If gangster rap isn’t really your style, mix it up a bit and try some songs you like. Let’s take a look at Idahosa in action and see some of his mimic skills. If you want to know more about the Mimic Method, and how to find THE FLOW, have a look at his website here. Another Rapper/Comedian/English Teacher I have to mention in this article, is a friend of Real Life English, Dawg. Dawg (a.k.a Rodrigo Honorato), has been teaching and performing around Belo Horizonte for some time now. Take a look at how he and his friends have mastered the language through rhythm and music, and at the same time not abandoning their Brazilian roots. Another method of learning through music is the more traditional way of dissecting the song. This can be done by, focusing on the vocabulary and grammatical structure, singing along in your car, on the bus, or at home in your free time. Let’s have a look at how much we can learn from just one verse of a famous song. Because we’ve been talking about rap with the mimic method, let’s use the great Gangster’s Paradise by Coolio. What are you doing? Becomes, What-cha do’in? She isn’t talking to me / She ain’t talking to me no more. Check out a further explanation of “ain’t” with our favorite gangster teacher Dawg. As explained by Dawg, Hip Hop grammar is not always technically correct, but it’s very common in spoken English. The cultural aspect would be, “Or you and your homies might be lined in chalk.” To be “lined in chalk” is when the police draw a line around a dead body so they can take the body away and know the positioning of the body for further investigating. With just one verse of the song, we have learnt not only vocabulary and pronunciation, but we also get some insight into the U.S. gangster culture, as morbid as it may be. This exercise can sometimes be a little difficult to do, especially if your level of English isn’t so advanced, so I suggest to my students to use some very cool blogs and websites to help them with this process. This blog is dedicated to rock fans who want to improve their English through classic and more modern rock hits. Diego, the site creator, created the blog based on his English learning experience, and his love for music. Whether you’re a rock fan or not, this is a great resource for all learners. In this blog, Ueritom takes a close look at many songs from a number of different genres. He goes through the lyrics of each song, focusing on grammar and vocabulary. Another great resource for Portuguese speakers. So, next time you’re listening to your favorite tunes, try to make it an English lesson. Whether you understand the lyrics or not, pay attention to the sounds and phonetics, this will ultimately help you with your pronunciation. And as far as vocabulary goes, like my experience with Portuguese, you’re going to become more and more accustomed to English (maybe subconsciously) with every track you listen to. If you have any cool songs to for learning English, please post on the Real Life English facebook community. Good article. One of my students is a musician, so I plan on using music as part of our learning. Unlike many students, she’s not learning it for a test or job.